The Dar al Atta'a charity, in association with the Shangri-La at Barr Al Jissah have launched a Junior Masterchef competition which is going to be held on the 11th of July. 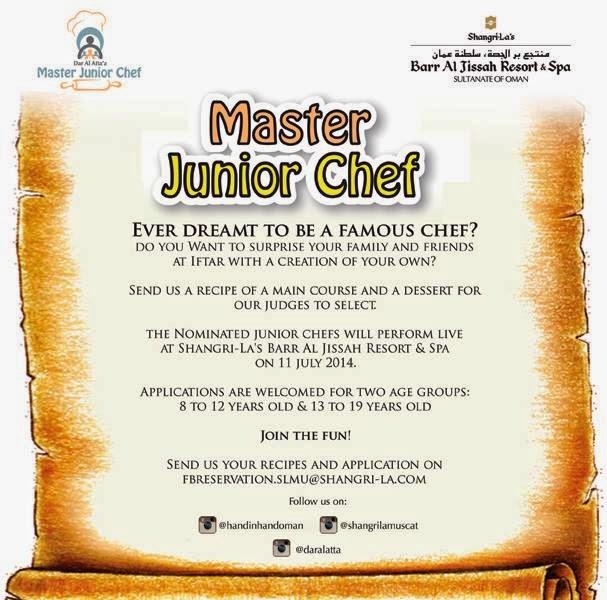 There are 2 age groups, 8-12 and 13-19 - and to get into the competition, send your proposed menu (for an Iftar) in to fbreservation.slmu@shangri-la.com and they'll contact you if they like your proposal. I think the height of my culinary expertise by age 19 was making a Homepride Pastabake, I made it extra fancy by putting bits of chicken into it ;) I'm guessing that 19-year-old me probably wouldn't cut it in this competition! Something different and interesting for those with kids here for the summer. Is it so difficult for them to get a decent copywriter and designer?